FastX is program used to run graphical applications on our Linux servers remotely. This uses a different technology from remote X, which results in better performance, especially when not on campus. This also allows for suspending and resuming sessions and programs, while they continue to run. This allows the use of long-running graphical applications. If you are off campus, you will need to use our VPN to use FastX. See our Dartmouth VPN page for help installing and using the VPN software. 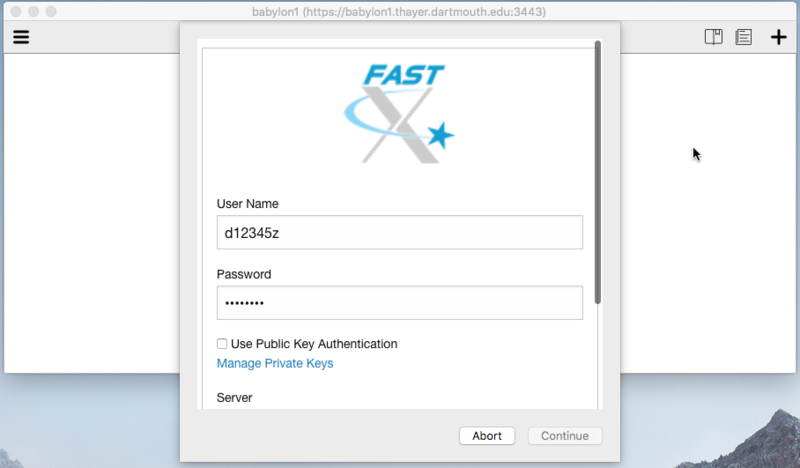 The FastX Client software is already installed on all Thayer lab computers Go to the- Linux and Windows. 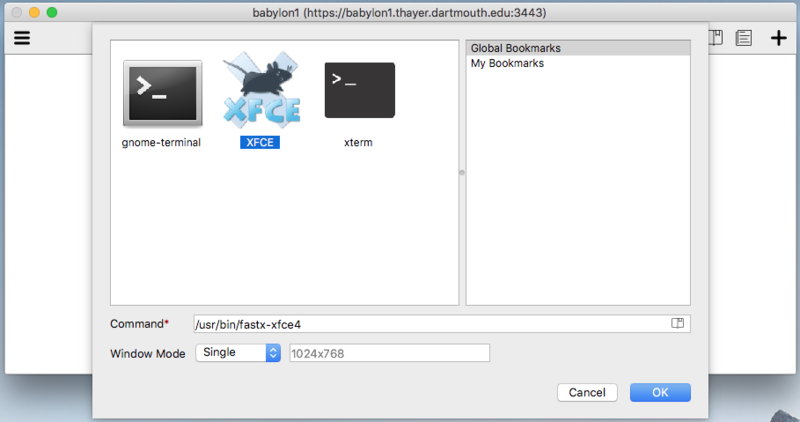 Mount the dmg file (your browser may do this for you after download) and drag the FastX application to your Applications folder. The client available from FastX has a bug causing it not to work properly on many Windows 10 machines, so we recommend using our fixed version. 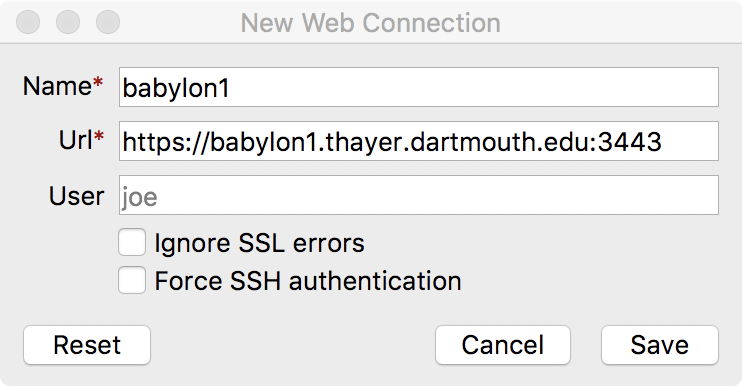 Connect to ThayerFS (Thayer Shares Connecting) - be sure to use the Dartmouth VPN if you're off campus. Double-click the FastX_fixed_2.0.111.exe setup file and follow the instructions in the wizard to install the software. When you first run the FastX client, you will be presented with the Connection Browser, which will initially be empty. This will contain connections to each remote FastX server you set up. 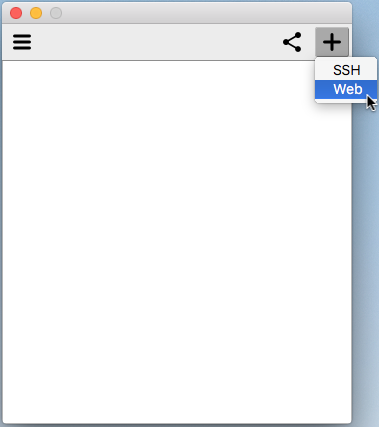 Click the "plus" icon and select "web" to create a new connection. Click "Save" to save the connection. When you first save a new connection, it will automatically attempt to connect. The next time you run FastX, just double-click the connection you'd like to start the process. When you connect, you'll be prompted for your NetID and password. Enter these and either press return or scroll down and click "Log In"
After you log in successfully, you will get a message that you are logged in. Click "Continue"
You will then be at the Session Browser which will display any existing sessions you have on that server (or any of the babylon servers, if you're connected to one). To create a new session, click the "plus" in the top-right corner of the Session Browser. Here, you will be presented with different sessions you can create. Double-click on the session you wish to start. XFCE is a full desktop session, where gnome-terminal and xterm are just a terminal session. If you have existing running sessions, click the session you which to resume and click the "play" icon. You can also click the "pencil" icon to rename a session and give it a more meaningful label. You can also use FastX from a web browser, although we recommend the client for full functionality.